Naming a fictional character “Reality Winner”—especially a character who winds up receiving the longest prison sentence ever given for leaking classified government information, as you learn from projections in the lobby of Is This a Room—would feel absurdly heavy-handed in its ironic foreshadowing. You’d never do it. But Reality Leigh Winner—Air Force veteran, gifted linguist, civilian contractor for the NSA—is an all-too-real person with an all-too-real story. Her interrogation by the FBI on June 3, 2017, comprises the script for the new piece by Tina Satter and her company, Half Straddle. Verbatim theater is often an exercise in constraints—you have to work with the material you’ve got to shape a story. But Is This a Room feels almost like a Duchamp readymade: the transcript is presented in its entirety, down to the redactions, and it forms a taut, crazily suspenseful, human-interest-filled story all by itself. The play is the interrogation, nothing more, nothing less: 80 pages of transcript, just about 70 minutes, one suspect (Emily Davis, whose striking resemblance to Reality makes the whole thing somehow even eerier), two FBI agents (Pete Simpson and T.L. Thompson), plus an “Unknown Male” (Becca Blackwell), who stands in for the cadre of unseen agents who descended upon and searched Reality’s home, constantly on cellphone and walkie-talkie muttering and barking logistical orders. At the end of this short period, Reality was arrested. On one level, the interviews are surprisingly calm, sometimes taking on an almost soothing tone. No one is yelling; no one is applying anything more than the gentlest of pressure; both agents are bending over backwards to appear reasonable, to offer Reality water and make sure her pets are taken care of. (What they do not do, you may notice, is read her Miranda rights.) And yet the experience is still completely terrifying. 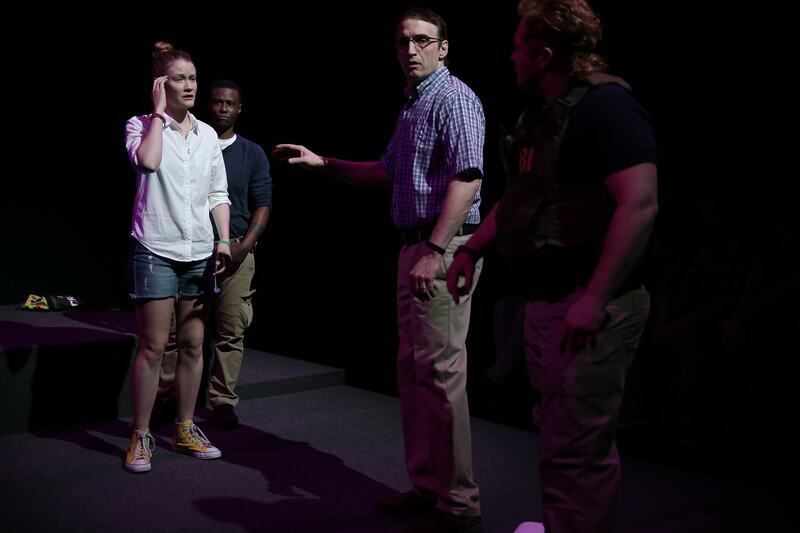 Reality is outnumbered; director Tina Satter’s staging ramps up the tension by constantly massing the three agents together, or lining them up, in opposition to their target: three large men, men making the most of their physical presence, countering one slight woman in shorts and yellow high-top sneakers. She’s trying to play it cool, but her composure inevitably begins to crack. She keeps trying to turn her back on them, to gain some physical privacy, and they keep looming over her. It quickly becomes clear that the agents know what they’re looking for, they know what Reality Winner has done; they’re trying niceness because it seems like a more productive tactic than a show of force, not out of any sort of genuine decency. In fact, every word of their small talk—attempts to bond over the love of pets, over guns; the agents’ attempts to compliment Reality on her language skills (she interprets and translates Pashto, Dari, and Farsi)—all of it could be just strategically constructed lies. And even if it’s all legitimate, all of a sudden the tiniest details of her life have been shifted into tools to be used against her. Two of the three male characters are played by trans performers (Thompson and Blackwell), which adds another layer to the conscious way the agents use their masculinity as a threat. Blackwell , in particular, is a collection of cultural signifiers for a particular kind of masculine dominance: tactical vest, all kinds of technical gear, dark shades, constant interruptions that aren’t really germane but serve to assert presence, and a constant use of their physical bulk to add intimidating weight to the others’ questioning. Thompson, as Special Agent R. Wallace Taylor—Wally—is more of a knife blade: perfectly reasonable surface, but always just one level more intense, more threatening, than his partner; always just a tiny bit invasive of Reality’s personal space. As Special Agent Justin Garrick, Pete Simpson exudes a kind of “ordinary guy” vibe, but it’s almost too perfect, too practiced in its folksiness. Every once in a while, you can see Reality realize that a noose is tightening around her, but it’s so smooth, so gradual, that she can’t step out of it. Davis makes Reality both an optimist and a pragmatist: she’s a person who wants to do something meaningful with her life; she’s smart and frustrated and strong and has somehow ended up in a place that’s exactly not where she wants to be. Still, she has a plan; she’s making the best of it—and then she made one decision that is about to change her life. You can see her thinking through how best to handle every question: how to be compliant, how to keep herself and her pets safe, how to get out of this situation. But there isn’t any way out. The deck was always already stacked against her, before she got out of her car. Satter uses Sanae Yamada’s score and lighting to “blip out” the redacted sections in the original transcripts, which feels like questioning the underlying reality in which the piece exists. (Some of the redactions are made even more absurd and surreal by the fact that we in the audience already know where the document Reality leaked was published and what it said.) Is this a Kafka-esque fantasy, or is it reality? And the un-redacted sections of the material have plenty of their own surreality, not least the “room” of the title: the bulk of the interrogation takes place in an unfurnished spare room in Reality’s house, a room she finds dirty and creepy for some never-explained reason. You won’t necessarily learn why Reality did what she did—or even really exactly what she did—in the confines of the interrogation; you need the news for that. For something so detailed, the whole thing feels blankly abstract at times: it’s a look at process, not plot; it’s an analysis of the dynamics of power more than a narrative. But there’s enormous impact in that balance of the specific and the general, of the minute details of what happened to this one person on this one day, down to where her cat goes to hide while her house is being search, with giant, global questions about the security apparatus of the state and how power is wielded.